1. Question – Mr. Atila S. Guimarães, in our country many people know your name, which symbolizes the fight for Catholic Tradition and for the Church in this current catastrophic situation. Many readers also have read your publications and the well-known book In the Murky Waters of Vatican II. Could you tell our readers about the beginning of your work in fighting for Tradition? When did you begin your writing against Modernism and the situation in the Church? Answer: It is not without surprise that I hear that my name and my book are known in your country. But it is rewarding to acknowledge what you affirm. I began to fight for Catholic Tradition in 1964, shortly after my 18th year, that is, when Vatican II was still in its third session. I met an outstanding Brazilian Catholic leader, Professor Plinio Corrêa de Oliveira, who expounded a unique panorama of the Philosophy of History, in which the present-day crisis of the Church inserts itself as the last and most important assault on the centuries-old enemies of the Catholic Church and Christendom. I have always loved the Holy Church and her reflection in the temporal sphere. When I considered the picture presented by Prof. Corrêa de Oliveira, I realized the importance of the fight against these enemies and the need for people to make it. It was then that I dedicated my life to this fight. I have spent my time preparing myself for the fight, studying the weak points of the enemies, and trying to destroy them with the small means I have had at hand. In 1982, it was also Prof. Corrêa de Oliveira who invited me to study Vatican Council II and to write the collection I made on it. 2. Question – Your books are very clear in the arguments, and you quote primary sources of post-conciliar documents about Vatican II and other topics. Your commentaries are exact and factual. Also, the newly published Animus Delendi II. When did you begin to write the 11-volume Collection Eli, Eli Lamma Sabacthani? Answer: During 1982 I studied the Council and drafted a first hypothesis on what would be the doctrine that inspired it. But obviously I had many doubts. I made a long list of points that needed more explanation. In 1983 I went to Europe to knock on the doors of some of the most important theologians who inspired and prepared the documents of Vatican II. I presented myself as a student of the Council searching for explanations. They received me amiably and answered many of my questions. Those meetings were very useful for me. The theologians showed me the direct path to follow to understand many things that would have taken me a long time to find out on my own. I returned to Brazil with a clear idea of what to read and study, and how to prepare my denunciation of the progressivist current. After searching, reading, and studying for another year, I began to draft the first volume: In the Murky Waters of Vatican II. Then came the other volumes. During the writing I would often have to stop and study other needed doctrinal or historical points. In October 1991 I finished writing the eleven volumes. I had to return many times to update these volumes. Even now, for each volume that comes to light, I need to insert new data and commentaries. Last month Animus Delendi II was released, the fifth volume of the collection. The same process was followed with it. 3. Question: You mentioned that you met many theologians. Would it be indiscrete to ask you who they were? Also could you give our readers an example of the topics you discussed with them? Answer: I don’t think that it is indiscrete, since I don’t have anything to hide about these interviews. Once in while I quote them in my writings. I also met there some members of the International Theological Commission (ITC), a very prestigious body among theologians. I met Fr. 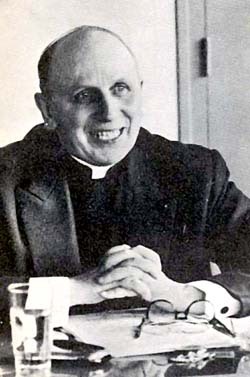 Joseph Fuchs, a German, twice, Fr. Edouard Hammel, a Canadian, twice, and Fr. Juan Alfaro, a Spaniard once: the three of them were Jesuit professors at the Gregorian University, certainly the leading educational institute in Rome; in Rome I also met Fr. Barnabas Ahern, an American, from the same Theological Commission. In Louvain, Belgium, I met the general secretary of the ITC, Msgr. Philippe Delhaye, twice. In Paris I met another ITC member, Fr. Bernard Sesboué. In Innsbruck, Austria, I had an appointment with Fr. Karl Rahner, but he had a heart attack a few days before our meeting date and was transferred to a clinic in Munich. Fr. Raymond Schwager, Director of the College of Theology at the University of Innsbruck, replaced Fr. Rahner and received me twice, providing me with very good data. I tape-recorded all these interviews. Once in a while I quote them. You asked me for an example of the topics I dealt with in these meetings. 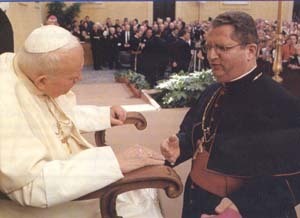 I remember that I asked Cardinal Congar if he could indicate to me the model for the Church of the future. He gave a curious answer that I reproduce with my own words. He said: You should look to your own continent and your country. The future of the Church will move in the direction of the Liberation Theology of South American theologians like the Brazilian Leonardo Boff and the Peruvian Gustavo Gutierrez. Congar was a well-informed and serious man; he was not just trying to be amiable and please me by praising Brazil and South America. He was quite convinced of what he was telling me. When I analyze the direction the Church is taking today, I often am reminded of Congar’s view of the future Church. The recent election in Brazil of a Catholic and Communist, Lula, a man who owes his entire political existence to the Basic Christian Communities, which are cell-groups that spread Liberation Theology, gives a new actuality to this current. Let us see what will happen there and if this election will have an influence on the direction of the future Church. At any rate, this recent fact draws attention to Congar’s prediction. 4. Question: You work with Dr. Marian Therese Horvat? How long have you cooperated together? Answer: My work with Dr. Horvat began in 1996, when she translated and edited a statement I wrote analyzing the talk that Archbishop John Quinn gave at Oxford about the future of the Church and the Papacy. My piece was published in the United States in The Wanderer, December 26, 1996. After that, in 1997, we worked together to launch the English edition of In the Murky Waters of Vatican II, which was the first volume of my collection to come to light. She played a decisive role in the translation, the publication, and the dissemination of this book. In 1998 I came to the United States to work out details of publishing the second edition of this book. The next year, 1999, I moved to the U.S., and since then we have been working in a closer collaboration. 5. Question: You also cooperate with the magazines The Remnant and Catholic Family News. How long have you collaborated with Mr. Michael Matt and Mr. John Vennari? Answer: My collaboration with Mr. John Vennari and Catholic Family News began when I was still in Brazil. He wrote a book review on Murky Waters, and afterwards he invited me to review a book on Vatican II by Dr. Ralph McInerny, which I did. He published my piece in his newspaper. After I moved to the U.S. he has frequently asked me to write articles or book reviews. My collaboration with Mr. Michael Matt and The Remnant began in 1999. Mr. Matt invited me to be a regular columnist for his newspaper. I have a column on contemporary religious analysis called Bird’s Eye View of the News. At times I also write an article for The Remnant. 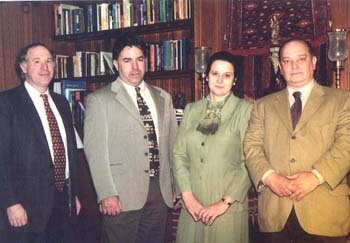 The collaboration with these two distinguished journalists became closer when we decided to publish together – the three of us plus Dr. Horvat – a statement declaring our position of resistance to the novelties of Vatican II and the things that came from it that do not harmonize with the prior Pontifical Magisterium of the Catholic Church. This statement was called We Resist You to the Face. One year later, the four of us published another statement on the proposed reform of the pontifical primacy: An Urgent Plea: Do Not Change the Papacy. Tradition in Action, which is the organization that Dr. Horvat is president of and with which I also collaborate, published Mr. Vennari’s book Close-ups of the Charismatic Movement this year (2002). TIA also disseminates the book Gods of the Wasteland by Mr. Matt. You can see that fortunately we are working in a very close collaboration. 6. 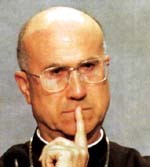 Question: The third Fatima message began with the words “The dogma of faith will be preserved in Portugal.” Dr. David Allen White, author of book The Mouth of the Lion, in one of his speeches said that he is personally persuaded that this sentence should be interpreted as speaking about the Diocese of Campos in Brazil where Portuguese is the official language, and about the Fraternity of St. Jean Marie Vianney. Do you agree with this opinion? Answer: I know Dr. David White and I have many points in common with him. But with due respect, I don’t agree with this thesis. I think that Our Lady knows enough geography to distinguish two countries that are quite very far apart from each other. If we should take her words in a broad sense, then we would not have an argument against the incomplete pontifical consecrations made by Pius XII and John Paul II. Why were their consecrations insufficient? Because they did not fulfill all of the conditions placed by Our Lady. The whole discussion on this topic is based on the precision of her words when she ordered the Pope to consecrate Russia to her Immaculate Heart together with the Bishops of the whole world. When she said Russia, she meant exactly Russia, and nothing else. The same precision that is expected in the fulfillment of a part of the Fatima message in which Our Lady spoke about one country, Russia, should also be observed in the part that spoke about another country, Portugal. When Our Lady said Portugal, she meant precisely Portugal, and not Brazil. I think Our Lady was referring to the little people who live in Portugal and who have a great devotion and belief in her. We can see them in the pilgrimages they make to Fatima. These people still have the Catholic faith. 7. Question: What do you think about the step of the Fraternity of St. Jean Marie Vianney that "reconciled" their relations with Rome and now is in the Indult position? Answer: It is always the same story: when some traditionalist priest panics because of his irregular canonical situation and starts to deal with the Vatican he tells his grassroots that he will not accept Vatican II and the New Mass, but he always ends by accepting them. Whosoever approaches the present day Vatican attempting to fool it or to take advantage of it, ends by being swallowed by it. In one of my columns I compared this to the relation of the chicken with the fox. The chicken tells its chicks that it will fool the fox and take advantage of it for the benefit of the family. In reality, it is not long before the chicken is eaten by the fox. In its relation with the Vatican, the Fraternity of St. Jean Marie Vianney began by telling its grassroots that it would continue to reject Vatican II and the New Mass. Some days ago I read an interview of the newly ordained Bishop Fernando Rifan of the St. Jean Marie Vianney Fraternity saying that he accepted Vatican II. 8. Question: What do you think about the so-called “indult” given to traditionalist priests? Do you think that it is the way for reconciliation with the visible structure of the Church? Answer: I don’t like the term “indult.” Normally, one uses indult to refer to a criminal whose sentence is deferred by the authority, or at least to refer to a person who was in the wrong path deserving of punishment, but was forgiven. This in no way applies to traditionalists regarding the Tridentine Mass. We are in the right path. In my opinion this term was coined by progressivists to depreciate Traditionalism. Therefore, I do not use it. I prefer to use the Latin word celebret – which means “it could be celebrated.” It is the official term used by the present day Vatican to allow the celebration of the Tridentine Mass. 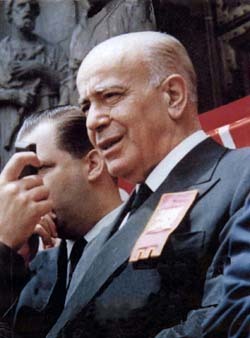 A demanding Cardinal Hoyos, at the head of the Ecclesia Dei Commission. If you want me to summarize my opinion, I would say: The celebret is good for the lay people and it is bad for the priest. I can explain. It is good for the lay people, because they can attend a true Mass celebrated according to the rite established by St. Pius V in his Quo primam. I think that these Masses are legitimate and valid. Therefore, the faithful can benefit from the Mass and the Sacraments. But it is bad for the priest. Because to receive the celebret, he has to sign a document with several points that include the acceptance of all the official documents of Council Vatican II and the whole liturgical reform of Paul VI. The acceptation of the Novus Ordo Mass is included in the acceptation of the liturgical reform. That is to say, when he signs the priest makes a de jure acceptance, agreeing that everything in Vatican II and in the liturgical reform is Catholic. Also when the priest signs that document, he obligates himself to never raise a public polemic about any point of Vatican II or the liturgical reform. If he has doubts about some particular issue, he can write to the Ecclesia Dei Commission, which will provide some answer, or the priest can direct the question to other religious authorities, but he cannot raise any public discussion. That is, it is a de facto acceptance. Therefore, with these two assents – de jure and de facto – the priest goes along with the whole Conciliar Church. It is contradictory for a priest who believes that the true Mass is the Tridentine Mass to have to compromise with the New Mass that he rejects and judges to have the flavor of heresy. In my opinion the situation of the priests who sign this document in order to have a regular canonical situation is analogous to the situation of the priests of the 18th century in France who accepted the French Revolution and made an oath of fidelity to the Civil Constitution of the Clergy in order to exert their ministry, avoid the persecution, and escape eventual martyrdom. Vatican II, according to the famous quote of Cardinal Suenens, was the French Revolution in the Church. A similar pusillanimous position was taken by many Catholics of the early Church, who burned incense to the Roman idols in order to not suffer martyrdom. They were called lapsi, which means the ones who failed. 9. Question: Some of faithful in our country joined the Society St. Pius X (SSPX). I heard that you are also attached with SSPX. What do you think about the life work of Msgr. Marcel Lefebvre and the Society St. Pius X? Answer: There is one erroneous piece of information in your question. I have never been a member of the SSPX. My work has been very well received by the grassroots of the SSPX, but has received a varied response from the heads of the Society. In 1999 and 2000 the superior of the SSPX in the United States, Fr. Peter Scott, publicly condemned my work two or three times, and more specifically my books Quo Vadis, Petre? and In the Murky Waters of Vatican II. In the last condemnation he also included in it the editors of The Remnant and Catholic Family News because they published my articles. You can see that this was not very friendly. On the other hand, in 2001 Bishop Richard Williamson wrote a letter to his supporters and donors praising In the Murky Waters and Animus Delendi I, inviting them to purchase and read these books. Bishop Bernard Felley, general superior of the SSPX, wrote a brief note of encouragement for We Resist You to the Face. Regarding the Society of St. Pius X, I have many points of affinity and some points of discordance. The dilemma: To fight or to hide in the catacombs? 10. Question: Do you think that the current crisis in Catholic Church will be ended by the human factor? For example, by actions of traditionalists, the faithful, and the clergy? Or by statements of a new Pope who will be a guardian of Catholic Tradition? Or must we wait for the victory of Immaculate Heard of Our Lady? What do you think about the future of Catholicism in general? Answer: I like your questions. They reveal a sincere concern for Holy Mother Church. Let me try to summarize the answers. First, because, considering the ensemble of History, the glory of God demands that this crisis end and that the Church should shine again more splendidly over the whole world and a new Christendom including all the nations should rise. Second, because Our Lady promised it at Fatima: she will conquer and her reign will be established on earth for a long period of time. Therefore, the victory will come. And it will be mainly by supernatural action. But I don’t think that this future supernatural intervention dispenses us from the fight now. It would be very safe and comfortable to hide in a catacomb and say: “I am waiting for the divine intervention Our Lady promised. Therefore I need to stay in the state of grace, but I don’t need to do anything else.” Regarding remaining in the state of grace I agree toto corde [with all my heart], but regarding hiding in the catacombs passively, I affirm the opposite: we ought to fight in the open sun. I am applying the principle of St. Ignatius of Loyola: “Do everything you can as if the situation depended only on your action; then wait for the divine action as if it were only God who would do everything.” It is a balanced and wise principle. I think we have a grave moral obligation to fight for the Catholic Church and for Christendom as if everything would depend on us. If we are just a few, we have to multiply our efforts. That is my point. Someone could present an objection saying that this action is useless because it is impossible to defeat the progressivist forces that took over the Church. I would answer: No, it is not. There are many things that we can do to stop the advance of Progressivism in the Church. A wasp can do a lot of damage if it knows how and where to attack an elephant. You can easily imagine how an elephant could lose control with a wasp stinging it inside its trunk. Most of all, I think that we can offer this fight to Our Lord and Our Lady as a prayer begging them to intervene. It is the best prayer they can receive. 11. Question: Please, tell our readers about the next goals of Tradition in Action. Are you writing any new books? On which themes? Answer: Tradition in Action – TIA – is a small organization that has many goals in its by-laws. Presently we are turned to act in the conservative and traditionalist milieu in order to help the former to become traditionalist, and the latter to become counter-revolutionary. Let me give you a brief definition of what I understand each of these words to mean. The conservative is that person who doesn’t like to change, he likes what he received and what he is accustomed to. So, in face of the Revolution in the Catholic Church that changes everything, he opposes it because it breaks his habits and destroys what he is comfortable with. But this opposition does not have deep roots, because it is not supported by principles. For this reason, with time the conservative shifts little by little to the left. Yesterday, for example, he was opposed to pop music in the churches, today he approves the Masses at World Youth Days with rock and roll. The traditionalist is that person who, in face of the changes in the Catholic Church – Vatican II, the new Morals, the New Mass, the new liturgy, etc – wants to return to the time before Vatican II. That is, to the time when tradition was respected: good Morals, good customs, pious churches and devotions, the Mass of St. Pius V, of course, and many other good things. To reach this ideal some want to return to the time of Pius XII, others to the time of Pius XI, others further back. The counter-revolutionary is that person who, in face of the modern changes in the Church, wants to destroy the very source of these changes. He sees the changes as being the aim of a current – Progressivism – which is the heir of another current – Modernism – which was the heir of Liberalism. In its turn, Liberalism was linked to a whole ensemble of other currents that were inspired and supported by groups and associations that always worked and fought against the Catholic Church and Christendom. This movement began in the Middle Ages; with time it established a powerful network all around the world to fight the Catholic ideals. We call this movement the Revolution. So, the counter-revolutionary is that person who sees the Revolution behind the present-day changes in the Church and wants to destroy it. He wants to establish in the Church and in the civil society the very opposite of what the Revolution desires. This would be an order that would be traditional, but it is a kind of traditionalism that is always in position of counter-attack against evil. Tradition in Action has this conviction and does whatever it can to reach this goal. For the moment we are publishing books, writing articles, improving our website in order to give more principles to the conservatives and help them become traditionalists; and to show traditionalists the real enemy behind the scenes – the Revolution – in order to help them to become counter-revolutionaries. 1. A work on homosexuality – an update of the appendix of In the Murky Waters, in booklet form. 2. Another book by Dr. Horvat on Our Lady of Good Success. She already published two books on the topic, this will be the third. 3. Another volume of my collection on the Council. It will be Volume VI, Inveniet Fidem?, which deals with how Vatican II helped to destroy the Catholic Faith. 4. Several books by other authors are also being considered, but I don’t think that it is opportune to talk about that yet. As you know, many times the surprise is half of the victory. 12. Question: We also see persecutions against Fr. Nicolas Gruner. What do you think about his actions and work? Answer: I have a great admiration for Fr. Gruner. He is one of the most courageous priests I know. His fidelity to the true message of Fatima is edifying. 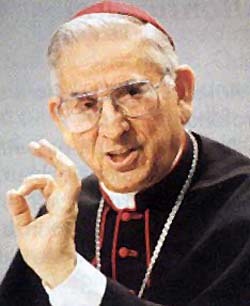 Many of the associations that defended Fatima and fought against Communism abandoned the field after the statements of Cardinal Angelo Sodano and Cardinal Joseph Ratzinger respectively made in May and June 2000. Fr. Gruner and his association remained standing on the battle line despite the enemies and storms. I admire him and his followers for that. The main reason for the persecutions he is suffering is his fidelity to the Catholic truth. To move ahead with these persecutions the progressivists are setting some canonical traps. I don’t know all the details of these canonical accusations.